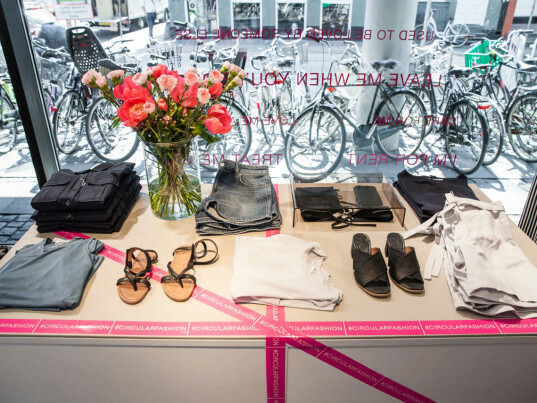 In honor of Thursday’s Copenhagen Fashion Summit, Swedish apparel company Filippa K has transformed its store in the Danish capital into a future, circular economy–ready version of itself. The biannual sustainablility event may be over, but from now through May 15, customers can lease any outfit in the store at only 20 percent of the original price. You can also return any unwanted Filippa K pieces to the retailer, which will recycle or resell them through its "Second Hand" label, in exchange for 15 percent off new styles. Preloved favorites from past Filippa K collections are available for perusal and purchase, as well, along with garment-life-extending tools such as as sweater stones, clothing brushes, and laundry mesh bags. Free for the taking? Tips for caring for and maintaining your clothes, which Filippa K has helpfully screened on the floor. Plus, spot and snap any of the retailer’s ambassadors—who will be tooling around town till Sunday in jackets emblazoned with messages such as “I’ve been around,” Love me or leave me,” and “You don’t own me”—and you’ll be entered to win a curated wardrobe worth €1000 ($1,130). In a circular economy, our wardrobe is “curated in a whole new way,” according to Elin Larsson, sustainability director at Filippa K. “We will have a mix of new, long-lasting pieces and secondhand,” Larsson said in a statement. And collaborative consumption, it seems, is a concept the firm is more than willing to get behind. Besides its occasional forays into “leasing the look,” Filippa K is also one of the brands participating in Sweden’s “ShareWear” clothing concept line, which anyone can borrow for free—provided they share it forward, that is. 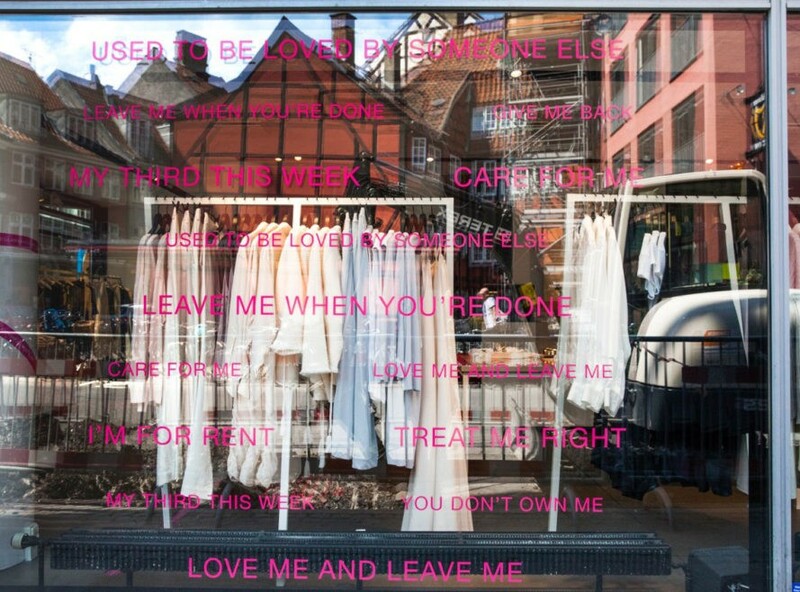 Plus, spot and snap any of the retailer's ambassadors—who will be tooling around town till Sunday in jackets emblazoned with messages such as "I've been around," Love me or leave me," and "You don't own me"—and you'll be entered to win a curated wardrobe worth €1000 ($1,130). A poster on the wall of the store explains its ethos. "If we want fashion to stay relevant and aesthetic [sic] inside and out, we need to be personal, simple, and long-lasting," it reads. "Ecosystems are our inspiration. Sustainability is our guide to growth. We are dedicated to a carefully curated wardrobe built on personal style, circular design, and a holistic approach to business. How we do something is how we do everything. What we do is long-lasting." In a circular economy, our wardrobe is "curated in a whole new way," according to Elin Larsson, sustainability director at Filippa K.
"We will have a mix of new, long-lasting pieces and secondhand," Larsson said in a statement. Besides its occasional forays into "leasing the look," Filippa K is also one of the brands participating in Sweden's "ShareWear" clothing concept line, which anyone can borrow for free—provided they share it forward, that is.